Originally from Normandy, it has been grown at Ribston Hall in Yorkshire since about 1709. The original Ribston Pippin tree at Ribston Hall finally succumbed in 1835. ‘It is commonly believed that the Ribston Pippin is a native of England, and that it sprang from seed in Yorkshire: on close investigation it, however, appears that this opinion is erroneous. The first account of its introduction which I received, was from Mr. R. A. Salisbury, who had been told, many years previously, by old Mr. Perfect, a nurseryman at Pontefract, that it was a French apple. I have since ascertained this to be true, through the kindness of Henry Grimstone, Esq. who was so good to enquire for me, at the fountain head, of one of the descendents of Sir Henry Goodricke, Bart., a gentleman formerly well known in Yorkshire, as having introduced many rare American Forest Trees, as well as French Fruits; and the Ribston Pippin appears to have been first imported by him, from Normandy, about a century ago. This Apple is highly esteemed in the London market, and well deserves a place in every garden; possessing most of the qualities requisite for the dessert as well as the kitchen.’ [PL pl.3/1818]. 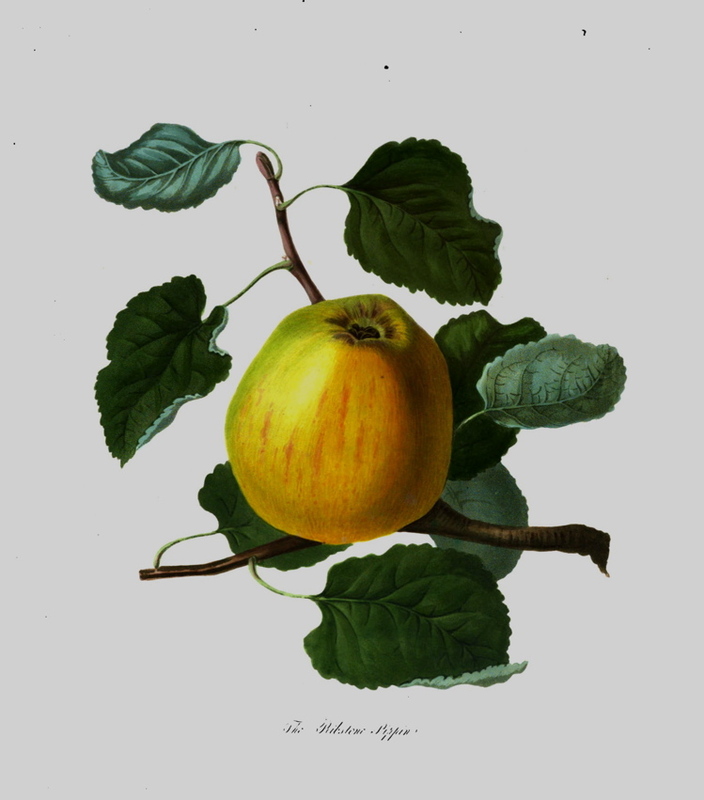 ‘There is no apple which has ever been introduced to this country, or indigenous to it, which is more generally cultivated, more familiarly known, or held in higher popular estimation, than the Ribston Pippin. It has long been in existence in this country, but did not become generally known till the end of the last century. It is not mentioned in any of the editions of Miller's Dictionary, or by any other author of that period; neither was it grown in the Brompton Park nursery in 1770. In 1785 I find it was grown to the extent of a quarter of a row, or about 25 plants; and as this supply seems to have sufficed for three years' demand, its merits must have been but little known. In 1788, it extended to one row, or about one hundred plants, and three years later to two rows; from 1791, it increased one row annually, till 1794, when it reached five rows. From these facts we may pretty well learn the rise and progress of its popularity. It is now in the same nursery cultivated to the extent of about 25 rows, or 2500 plants annually.’ [Hogg p.171/1851]. ‘This delicious apple needs no encomium. It is as highly appreciated as it is generally known.’ [Gard. Chron. 1844]. In 1909 Bealby wrote from Canada: ‘In the days of my grandfather in England, the queen of apples was the Ribstone Pippin; now there would seem to be two rivals for the pre-eminence from which the Ribstone has been deposed, namely, Cox’s Orange Pippin and the Yellow Newtown Pippin.’ [Bealby]. It is figured in the Pomona Brittanica [PB pl.88/1812]. ‘This is the King of Apples and should be included in every orchard where apples are grown.’ [David Crichton. NHM vol.1 p60/1864]. Listed in all catalogues [Apple no.3/1843]. There are two references to the quality of fruit in William Macarthur’s records. February-May. Excellent dessert apple, very highly flavoured without the briskness of the Scarlet Nonpareil. [Notebook no.9, MP A2948]. February to April. Splendid dessert fruit, bears well, very much affected by apple aphis. [Diary B, 1862, MP A2951].